Hello, and welcome back to our blog. 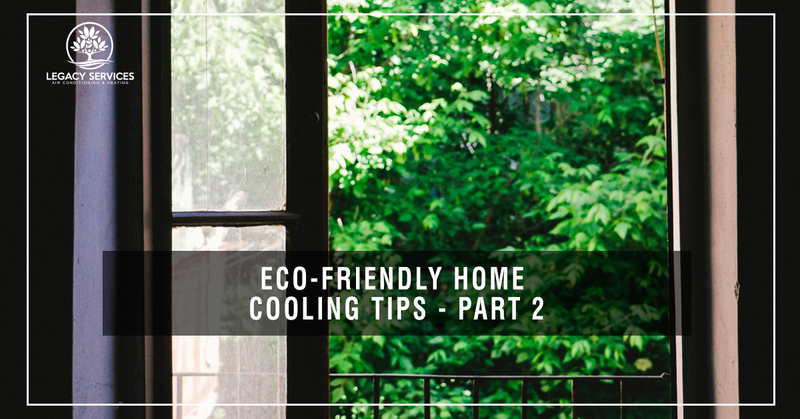 In part one of our Eco-friendly home cooling tips blog series, we explored some of Eco-friendly ways to keep your New Braunfels home cool while reducing energy usage. Your HVAC system has a huge impact on the environment, yet by incorporating other cooling methods into your air conditioning, you can decrease energy costs and improve energy efficiency. In part two, we’ll share more excellent energy-saving tips with you to keep you and your loved ones cool, while also reducing your carbon footprint. Please continue reading below to learn more. In part one of our blog series, we recommended installing energy efficient interior and exterior window treatments that are both affordable and effective at reducing solar heat gains within the home. These window treatments include interior and exterior blinds (both vertical and horizontal), drapes, and shades. We also suggested installing exterior window awnings to protect areas of the home that experience a lot of sun exposure. Awnings provide constant shade over your windows that reduces the amount of direct sunlight entering into your home. High reflective tinted window films are another cost- and energy-efficient method for reducing heat in the home and decreasing energy usage. Finally, we recommended installing programmable thermostats for maintaining a consistent temperature within the home, whether you are there or on the go. Below are some more great energy efficient tips for cooling your home. A simple and fun solution to keeping your home cool is by planting trees and other greenery near windows. While trees do take some time to grow, there are larger trees available for planting that will provide immediate shade, which will shade your home by blocking solar heat gains from entering through windows. Not only that, trees and shrubs liven up the exterior of your home and offer a nice view from the interior of your home when inside. Check out the City of New Braunfels site for a list of trees that are best suited for the climate here in our gorgeous city. Air filters are a key component to your air conditioning unit that help regulate the quality of air traveling from the AC unit into the home. Filters are usually located at the blower unit and are very easy to change. For your air conditioning system to function efficiently, it is best to replace your air filters every four to six weeks or at minimum, every three months. During the summer months when your air conditioner is used significantly, it is best to change air filters more frequently. Air filters capture particles in the air such as dust and pet hair, causing your air filter to get dirty and in worst case scenarios, clogged. Along with changing them regularly, be sure to clean in and around the vent returns to minimize dust build-up, which also extend the life of your filter. To ensure that your HVAC system is running properly with steady air flow and efficient energy usage, it is important to have your air conditioned checked regularly by one of our knowledgeable HVAC technicians. Our experienced air conditioning experts are committed to keeping your New Braunfels home at a comfortable temperature year-round. What is more, with regular HVAC maintenance, you’ll gain peace of mind in knowing that your system is operating at its full potential, in the most energy-efficient manner. Our technicians will check your air filter quality, investigate your air ducts for leaks, inspect all the components of your HVAC system, including the thermostat, and will make any necessary recommendation for repairs or replacements. We hope you have found our energy-efficient home cooling tips helpful. At Legacy Cooling and Heating Services in New Braunfels, we are fully dedicated to improving the air quality and temperature levels in your home so that you and your loved ones are always comfortable and happy, no matter the season. Call us today for a free service estimate and to schedule your next HVAC service.